UPPSC RO/ ARO Recruitment 2016 – Apply Online for 361 Review Officer/Assistant Review Officer Vacancies UP RO/ ARO Examination: UPPSC recruitment announced for UP PSC Asst Review Officer vacancy against Advt. No. A-2/E-1/2016. 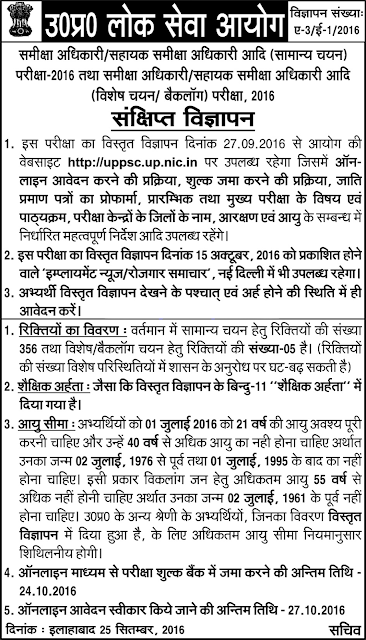 Uttar Pradesh Public Service Commission (UPPSC) has issued a recruitment notification for Asst Review Officer posts. Online applications are invited for Uttar Pradesh Review Officer/Assistant Review Officer Recruitment Examination for 361 Asst Review Officer Vacancies. Age Limit: Candidates upper age limit should be between 21 years to 40 years as on 01-07-2017. Age relaxation will be applicable as per rules. Reservation will be given for Residents of Uttar Pradesh only, Candidates from other states will be considered as General category candidates. Educational Qualification: Candidates should possess the qualification of Bachelor Degree in any discipline from any Recognized University in India. Application Fee: General/ OBC candidates have to pay Rs. 125/- as application fee (Non Refundable) while SC/ ST category candidates of Uttar Pradesh will have to pay only Rs. 65/- as application fee and Rs. 25/- for Handicapped candidates. Mode of Selection: Eligible candidates will be selected for Asst Review Officer posts on the basis of their performance in Preliminary and Main written exam followed by Interview. How to Apply Online: All those Eligible candidates who wish to Apply Online for UPPSC RO/ ARO Recruitment for UP Assistant Review Officer Recruitment Examination in Uttar Pradesh, they are required to apply through online mode on its official website at www.uppsc.gov.in from 27th September to 27th October 2016. 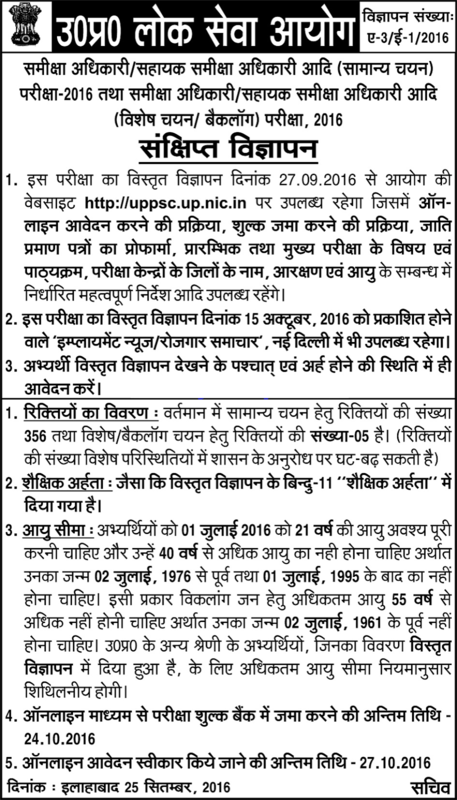 Log on to official website at www.uppsc.gov.in. Click on “Review Officer/Assistant Review Officer”. Click on Apply link then on Candidate Registration. More Details: If you want more information about UP Assistant Review Officer vacancy for UPPSC RO/ ARO recruitment regarding Age limitations, Academic Qualification, Recruitment process, Pay Scale and other details read official notification followed by the link given below.